The "Group Layer" is a special layer that can hold other layers. It is generated via the Group command accessed via the context menu in the Layers Panel or through the Layer Menu in the Canvas Menu Caret. As well as grouping a set of layers it can also translate them, scale them, and even modify the time for the layers it contains. "Group Layers" can also be created through the New Layer Menu, using "<New Layer> → <Other> → Group Layer". The "Transformation" parameter is a composite parameter, it hold an Offset, a rotation angle, a skew angle and a scale value for the group. The "Transformation" parameter is already converted to composite when the Group Layer is created and so directly expose the Offset, Rotation, Skew and Scale subparameters. This is "Group" by default if the "Group Layers" was created by grouping other layers, or "No Image Selected" if it was created from the New Layer Menu. This parameter lets you select another canvas. In its simplest form, this is just an id, ie. the exported name of one of the child canvases of the current canvas. if a '#' is present, the part before the '#' is interpreted as the filename of an external .sif file to use. /usr/share/doc/synfig/examples/business_card.sifz#:IndividualCard -- gives the absolute path to a .sifz file, and says to use the canvas that was exported from its root canvas as "IndividualCard"
#:sy:head:eyes:left -- look in the current composition, and starting from the root, navigate down through the canvas tree. Find a child canvas of the root canvas called 'sy', look in 'sy' for a child canvas called 'head', and so on. This parameter allows to control thickness of all outline layers inside. Assigning positive value to this parameter makes all child outlines rendered thicker, while negative value makes them look thinner. 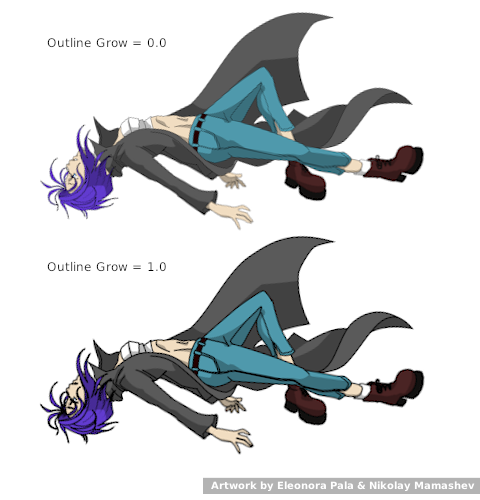 This feature is very helpful for tuning outlines in complex artwork and it also allows to achieve some nice effects like constant outline width at any zoom level. Note: The "Outline Grow" parameter can not be applied to exported and imported (external) Groups layers. Z_Depth area where layers inside are partially visible. Set it to zero, it would stop the animation. A value of one makes the animation run at normal speed and a value of two makes it run double speed. Minus one reverses the animation. This page was last modified on 26 February 2017, at 07:04.